Indian summer monsoon rainfall; false onset; low-frequency intraseasonal oscillations; NPISO, Madden–Julian Oscillation. 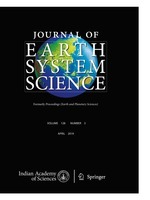 We analyze the dynamical features and responsible factors of the low-frequency intraseasonal time scales which inﬂuenced the nature of onset, intensity and duration of active/break phases and withdrawal of the monsoon during the anomalous Indian summer monsoon of 2002 – the most severe drought recorded in recent times. During that season, persistent warm sea surface temperature anomalies over the equatorial Indian Ocean played a signiﬁcant role in modulating the strength of the monsoon Hadley circulation. This in turn affected the onset and intense break spells especially the long break during the peak monsoon month of July. Strong low-frequency intraseasonal modulations with signiﬁcant impact on the onset and active/break phases occurred in 2002 which were manifested as a good association between low-frequency intraseasonal oscillations and the onset and active/break spells. Further, SST anomalies over the equatorial Indo-Paciﬁc region on low-frequency intraseasonal time scales were found to affect the equatorial eastward and thereby off-equatorial northward propagations of enhanced convection over the Indian region. These propagations in turn modulated the active/break cycle deciding the consequent severity of the 2002 drought. Vikram Sarabhai Space Centre, Trivandrum 695 022, India.